Drain tofu, wrap in several layers of new paper towels and drain, pressing gently. Cut in half horizontally, then in slices vertically, then into bite size pieces. Heat a large non-stick skillet over medium-high, add in oil. In a medium bowl, whisk 4 teaspoons corn starch and 1 Tablespoon soy sauce. Add tofu and gently turn to coat. Add to hot skillet, pan fry until golden and crispy, 4 to 6 minutes. Shake the pan often, scraping gently as needed. Add in garlic and ginger, cook for 30 seconds. Toss in bell pepper, water chestnuts and drained pineapple, cook, stirring often for about 5 minutes. Meanwhile, in a medium bowl whisk together the remaining cornstarch and soy sauce, ketchup, sugar, rice vinegar and reserved pineapple juice. Pour over the tofu mixture, stir while the sauce comes to a quick boil, take off heat. 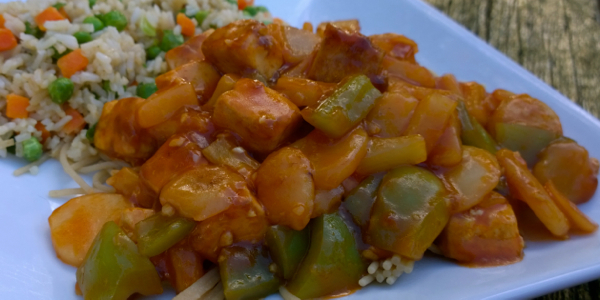 I served the tofu over gluten-free rice/golden flax pasta, making 8 ounces worth. And served with a side dish of lazy fried rice. It isn’t greasy, nor a salt bomb. Why do I use instant rice? You can use it hot, rather than having to make rice in advance and chilling it. It isn’t starch and clumpy, as fresh rice is often. Bring 2 cups water to boil in a small saucepan, add in rice, stir and cover. Take off heat and let sit for 10 minutes. Take off lid, let rest for 5 minutes. 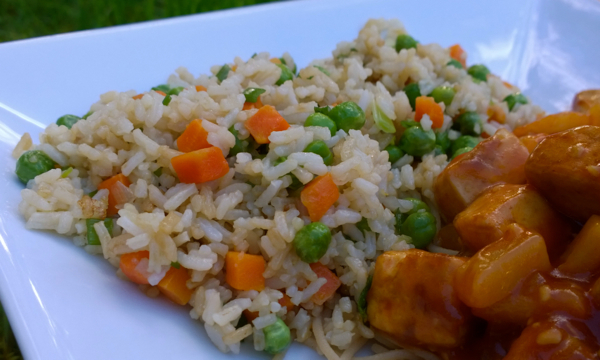 Heat a large skillet over medium-high heat, add in sesame oil, peas and carrots and green onions. Cook for a few minutes, then add in rice, tossing to mix. Drizzle the soy sauce on, work in. Add more soy sauce as desired. Cooking the rice in broth will make the finished rice more flavorful, if desired. Would this be something that could be dehydrated for Freezer Bag Cooking? I know that with moving you don’t have time to try it out now!